JAISAL SINGH IS Vice-President of Relais & Châteaux, Chief Operating Officer of SUJAN Luxury Hotels, Owner of Serai (Jaisalmer) and Sher Bagh (Ranthambhore). Jaisal Singh has a passion for delivering luxurious, authentic and sustainable hotel experiences in areas of outstanding natural beauty This is reflected in his SUJAN group which offers unique destination experiences, which are authentic and eco-conscious SUJAN believes in creating opportunities for communities and imparting a deep respect for the earth, through everything they do. 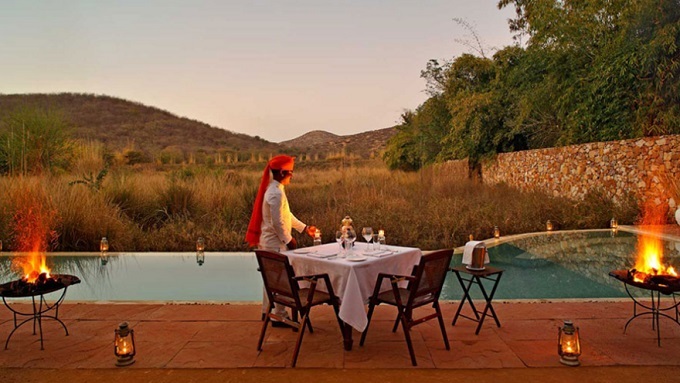 The Jawai Leopard Camp; Sher Bagh, Ranthambhore and The Serai, a luxury desert camp in Jaisalmer, are all part of the portfolio. In 2013 Singh was elected Vice-President, Member of the Executive Committee and Board of Directors of Relais and Chateaux, the first Indian to be elected to this position. 'I am the descendant of Sir Sobha Singh who worked closely with Sir Edwin Lutyens to construct and build the city of New Delhi. My parents first came to Ranthambhore in 1974, over 40 years ago, it was a discovery of an otherwise little-known ‘Paradise’. Their pioneering work through filming and documentation of the tigers of Ranthambhore as well as the great diversity of wildlife in the area had a strong impact on the way the world came to see Ranthambhore. Growing up around them and their friends, as a child, I spent much of my time there, often being rushed off from school in Delhi to track tigers. It was here, in close proximity to this unique wilderness, that I conceived and founded Sher Bagh, in 2000. See: With its 99 bastions the city of Jaisalmer seems like a mirage, explore its ancient alley ways with a local historian. -Visit the musician’s village of Manganiyars when generations have trained a royal muscians, 20 kilometres from Jaisalmer. - Watch a sunset over the Thar desert. The Serai, Jaisalmer, a luxurious camp, sits on a 100-acre private estate of indigenous desert scrub, drawing inspiration from the designs of the royal caravan sites of Rajputana; blending their dash and vivacity with modern amenities and services. Venture into the mystical environs of Jaisalmer, discover its fabled golden fortress, now a Unesco World Heritage Site. Amidst this haven of peace the SUJÁN spa offers treatments in enclosed gardens.. The enchanting location makes for a perfect evening to succumb to the charms of the legendary Manganiyars musicians. See: Go riding, in its stables Mihir Garh has rare horses of the Marwan breed. - Watch a polo game ,Jodphur hs been one of the major venues for polo since the 19th century. I have played against Salvatore Ferragamo (s please link to experts) ,the owner of Il Borro in Italy. This superb “Fortress of the Sun” overlooks the Thar desert, right in the heart of Rajasthan. Mihir Garh, designed throughout by Sidhart Singh and his wife Rashmi, was born out of their desire to share this heaven on earth. The fortress mirrors the architecture of the local villages, with its rounded edges, open fireplaces and alcoves, and the colour of the stone merges seamlessly with the surrounding sand. Mihir Garh stands as a tribute to this land swept by the desert winds and has been designed as an eco-friendly hotel. Unobstructed, spectacular views of the dramatic wilderness of Rajasthan and only ten tents in the red light of the setting sun. Jawai is the most sophisticated and ecological way to discover this lunar landscape, interrupted by amazing granite hills and inhabited by nomadic herdsmen. With canvas, stainless steel and leather accoutrements, both simple and sophisticated, the tents, which are surrounded by wide spaces, are like isolated from the rest of the world. Dine under the stars wherever you want and spend unforgettable days watching flamingos and above all leopards which live here in complete freedom. The Royal Family of Jaipur welcomes you to the most iconic of its palaces. H. H. Rajmata Padmini Devi has been personally involved in the restoration of the Rajmahal, her first residence after her marriage. This opulent palace has been redesigned as a sumptuous hotel. The spacious, light-filled suites are decorated with an unbelievable diversity of wallpapers/ the hotel is surrounded by carefully attended gardens and basins, the Rajmahal is at the heart of Jaipur, the “Pink City”, the capital of Rajasthan and polo; as a guest of the palace, you can watch a match from the royal box. Sher Bagh is a pioneering camp of luxurious tents nestling by the world renowned Ranthambhore Tiger Reserve. It is ideally situated for game drives and excursions into the finest habitat in the world to see tigers in the wild. Discover the 8th century fort of Ranthambhore, a Unesco World Heritage Site, Mughal ruins, palaces and cenotaphs. With a collective experience of over 40 years, it offers an unsurpassed game experience. When not out in the wild, relax by the swimming pool, offering vistas of the landscape. The cuisine combines British-Raj style lunches and traditional Indian dinners cooked over clay ovens using nourishing home-grown ingredients, handpicked from an organic garden. See: Go in search of the Bengal tiger the owner of Samode seems to know every tree in the Bandvhavgah Reserve. Marshes and meadows make a good contrastto the forest. Lodge and restaurant in a game reserve. Samode Safari Lodge is eco-designed, taking its inspiration from the architecture of the colourful neighbouring villages, and blends seamlessly into the country side. Separate, elegantly furnished and decorated lodges look out onto the wilderness. You are in the heart of India, on the edge of Bandhavgarh National Park, the territory with the highest density of tigers in the world. These splendid cats and the diverse flora and fauna of the region are explored in specially designed Safari vehicles with knowledgeable and articulate guides. The owners’ passion for food has led to the offering of an ever changing menu in different and exciting venues. With thanks to our friends at Relais & Chateaux for their Route de Bonheurs series on which this article is based.